Together these industries represent the UK Non-Financial Business Economy and account for around two thirds of the whole economy of the UK in terms of Gross Value Added. Public administration and defence, public sector health and education, finance and farming make up the difference between the UK Non-Financial Business Economy and the whole economy. The ABS has included estimates for the Insurance & reinsurance industries (SIC 2007 Groups 65.1 and 65.2 respectively) in its UK National releases since 2008. This is the only part of Financial and insurance activities (Section K) covered by the survey. As with any new time-series, estimates for these industries have remained experimental while ongoing quality assurance has taken place. This quality assurance has led the figures to be revised substantially in recent years with a resulting break in the series between 2009 and 2010. The estimates for this series have been removed from releases since November 2013 to allow for a more detailed quality assessment to be undertaken. The removal of these series does not affect other industries published as part of this release and has no impact on any other financial statistics published by ONS. Estimates published in this release include turnover, purchases, approximate Gross Value Added at basic prices (aGVA) and employment costs. All data are reported at current prices (effect of price changes included). Where the recession is mentioned it refers to the contraction of Gross Domestic Product (GDP) that started in 2008, the year from which a consistent ABS time series is available. For more information about the survey see the background notes. The ABS has a wide range of uses: for example, ABS statistics are essential contributors to the UK National Accounts, including the measurement of GDP, they are supplied to Eurostat to meet the requirements of the European Structural Business Statistics (SBS) Regulation, and are used by the devolved administrations and central and local government to monitor and inform policy development. For other uses see background note 3. Questions often asked of the ABS release are 'What is aGVA?' and ‘How does the measure of aGVA differ from the GVA measure in the National Accounts?’. For an overview of aGVA please see our new infographic 'What is aGVA?'. National Accounts carry out coverage adjustments, conceptual adjustments and coherence adjustments. The National Accounts estimate of GVA uses input from a number of sources, and covers the whole UK economy, whereas ABS does not include farming, financial or public sectors. ABS total aGVA is around two thirds of the National Accounts whole economy GVA because of these differences. For further information on aGVA, see background note 8. There is also a recently published article ‘A Comparison between ABS and National Accounts Measures of Value Added’ (462.3 Kb Pdf) which provides more detail. ONS makes every effort to provide informative commentary on the data in this release. Where possible, the commentary draws on evidence from businesses or other sources of information to help explain possible reasons behind the observed changes. However, in some places it can prove difficult to elicit detailed reasons for movements, for example, businesses may state a ‘change in the nature of business activity’. Consequently, it is not possible for all data movements to be fully explained. We constantly aim to improve this release and its associated commentary. We would welcome any feedback you might have, and would be particularly interested in knowing how you make use of these data to inform your work. Please contact us via email: abs@ons.gsi.gov.uk or telephone Heather Bovill on +44 (0)1633 455107. 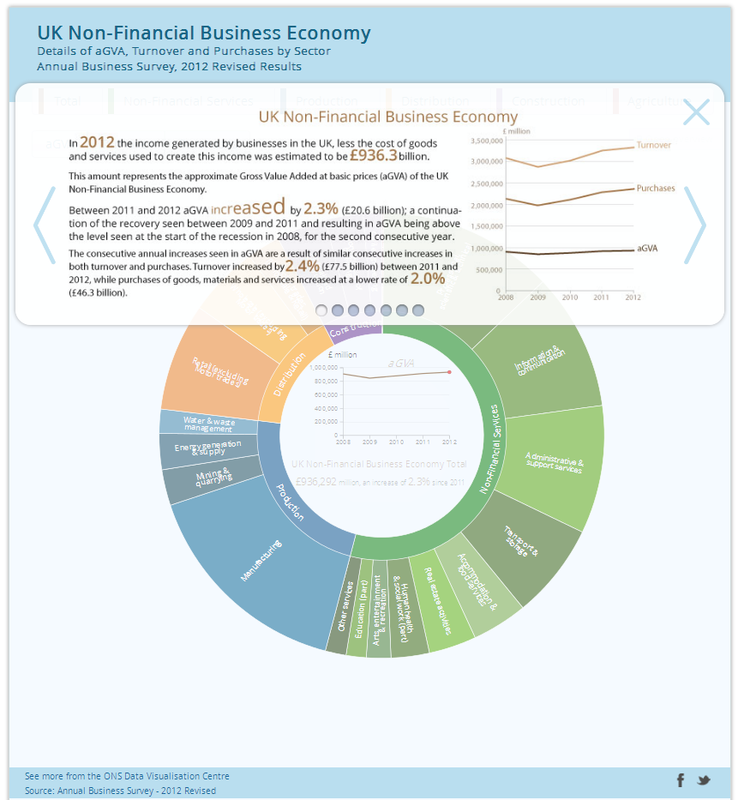 Use the Interactive Wheel to investigate which sectors contribute most to the UK Non-Financial Business Economy. Focus on the Business Economy as a whole or each sector and switch between aGVA, Turnover and Purchases. In 2012, the income generated by businesses in the UK, less the cost of goods and services used to create this income was estimated to be £936.3 billion. This amount represents the approximate Gross Value Added at basic prices (aGVA) of the UK Non-Financial Business Economy. Between 2011 and 2012 aGVA increased by 2.3% (£20.6 billion); a continuation of the recovery seen between 2009 and 2011 although at a slower rate. This increase resulted in aGVA being above the level seen at the start of the recession, in 2008, for the second consecutive year. The consecutive annual increases seen in aGVA are a result of similar consecutive increases in both turnover and purchases. Turnover increased by 2.4% (£77.5 billion) between 2011 and 2012, while purchases of goods, materials and services increased at a lower rate of 2.0% (£46.3 billion), resulting in an aGVA growth rate that was slightly lower than that for turnover. As with aGVA, turnover and purchases were above levels seen in 2008 at the start of the recession for the second consecutive year (see Figure 1). The recession and recovery described by the ABS between 2008 and 2012 is broadly in line with Gross Domestic Product (GDP) figures published in the National Accounts. Both the ABS aGVA estimates and the National Accounts GDP estimates show a fall between 2008 and 2009 and then three consecutive annual increases from 2009 to 2012. Due to the need to balance timeliness of the data with the accuracy, in-line with the ABS Revisions Policy, provisional ABS results are published in November with further quality assurance then leading to planned revisions to the data in subsequent releases. These revisions usually arise from the receipt of additional data and further validation of existing data by businesses responding to the ABS, which may include restructures that can result in data being reallocated to a different industry. When compared to the ABS Provisional results published on 14 November 2013, the revised 2012 results show minimal revision for the UK Non-Financial Business Economy. There were downward revisions to the 2012 estimates of 0.8% (£27.7 billion) in turnover, 0.7% (£16.1 billion) in purchases and 1.2% (£11.4 billion) in aGVA. The revisions to aGVA were driven by downward revisions within Distribution and Non-financial services. However, growth in aGVA between 2011 and 2012 is above the level estimated in the ABS Provisional release due to larger downward revisions to the 2011 estimates. Estimates of aGVA in 2011 have been revised down by 2.2% (£20.8 billion), driven by downward revisions within Distribution and Production industries. Despite the revisions the direction of movements of aGVA between 2011 and 2012 for the broad industry groups remains unchanged. A list of industries which are included in the ABS measure of the UK Non-Financial Business Economy, can be found in background note 8. Both the Non-Financial Services and the Construction sectors saw increases in aGVA between 2011 and 2012, while aGVA in the Production, Distribution and Agriculture (part) sectors experienced decreases. 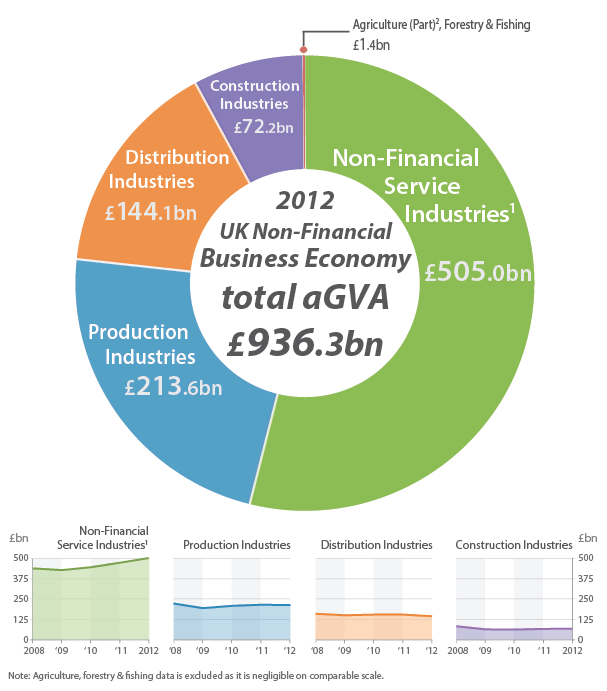 Non-Financial Services, the largest industry sector of the UK Non-Financial Business Economy contributed most to the increase in aGVA. Non-Financial Service sector aGVA rose by 5.8% (£27.5 billion) between 2011 and 2012, the third consecutive annual increase, taking aGVA to £505.0 billion. The Non-Financial Service sector is the only sector where aGVA is above the level seen in 2008, at the start of the recession. 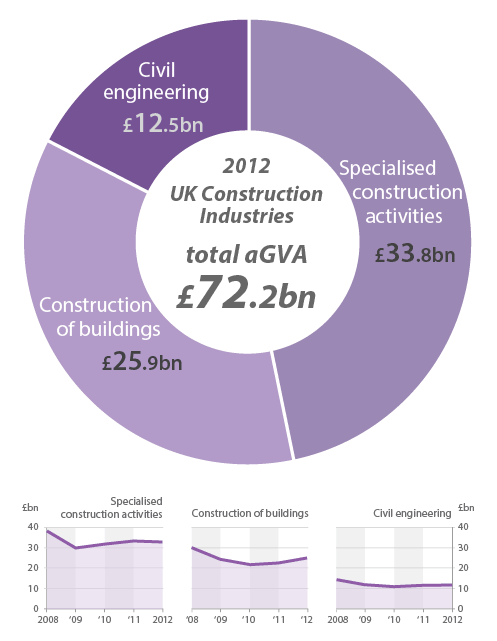 The Construction sector also experienced growth in aGVA between 2011 and 2012 for the second consecutive year, increasing by 2.9% (£2.1 billion), however, aGVA still remains below that seen in 2008. The Production sector saw a decrease in aGVA for the first time in three years, falling by just 0.8% (£1.6 billion) between 2011 and 2012. This has seen aGVA for the Production sector fall further below that in 2008, at the start of the recession. The Distribution sector experienced a second consecutive annual decrease in aGVA, with a fall of 4.7% (£7.1 billion) between 2011 and 2012. This keeps aGVA for the Distribution sector below the level seen in 2008. The Agriculture (part), forestry and fishing sector experienced a fall in aGVA of 11.4% (£0.2 billion) between 2011 and 2012, and at £1.4 billion, aGVA for the industry also remains lower than the level in 2008. Just over half (53.9%) of the estimated aGVA total of £936.3 billion in 2012 for the UK Non-Financial Business Economy was generated by the Non-Financial Service industries. Between 2011 and 2012 Non-Financial Service turnover increased at a higher rate than purchases, 4.5% (£46.0 billion) compared to 3.4% (£18.4 billion), resulting in aGVA rising by 5.8% (£27.5 billion). This is the third consecutive year of growth in aGVA for the sector, following the fall between 2008 and 2009. Turnover, purchases and aGVA are now well above the level seen in 2008 at the start of the recession (see Figure 4). When compared to the ABS provisional results published on 14 November 2013, the final 2011 and revised 2012 results show downward revisions to aGVA of -£2.6 billion and -£5.6 billion respectively. These revisions were driven by downward revisions to Transport & storage and Professional, scientific & technical activities (Section M) and resulted from a small number of businesses providing additional data, further validation of existing data or reporting restructuring. 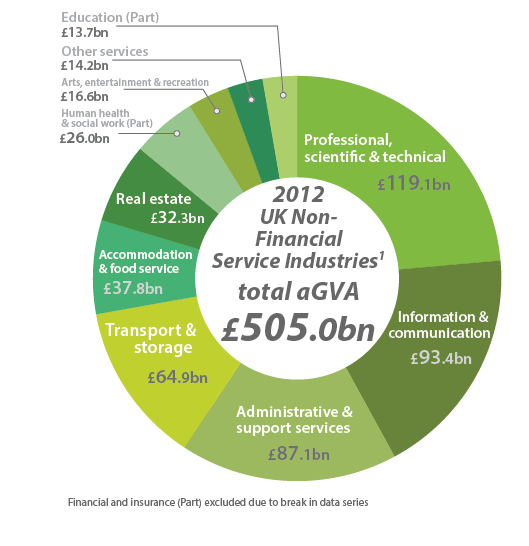 All of the industry sections within the Non-Financial Service sector saw increases in aGVA between 2011 and 2012 (see Figures 5 and 6). Those industries which have made the largest contributions to growth are Administrative & support service activities (Section N), Professional, scientific & technical activities (Section M), Transport & storage (Section H), and Real estate activities (Section L). Together these industries accounted for an increase in aGVA of £19.3 billion. Between 2011 and 2012 Administrative & support activities saw turnover rise by 3.3% (£5.6 billion), while purchases decreased by 1.5% (£1.3 billion) leading to an aGVA increase of 8.5% (£6.8 billion). The main industries driving growth within Administrative & support activities were Employment activities (Division 78) where aGVA increased by 16.4% (£3.6 billion). The growth has been driven by Temporary employment agency activities (Group 78.2) which may be a result of businesses being more likely to recruit temporary rather than permanent staff as a result of continued economic uncertainty. Rental & leasing activities (Division 77) also made a substantial contribution with an 8.7% (£1.3 billion) increase in aGVA. 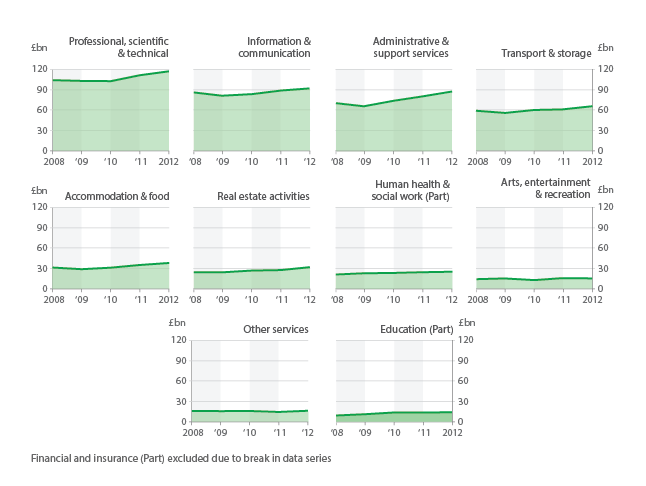 Turnover in Professional, scientific & technical activities increased by 3.4% (£6.8 billion) between 2011 and 2012, with purchases showing an increase of only 0.7% (£0.6 billion). This resulted in growth of 5.0% (£5.7 billion) in aGVA, resulting in aGVA remaining above that reported for 2008 for the second consecutive year. This broad section, which covers a range of industries from Legal & accounting activities to Advertising & market research and Veterinary activities, saw increases in aGVA in almost all its divisions between 2011 and 2012. Those making the largest impact on aGVA growth were Architectural & engineering activities & technical testing & analysis (Division 71), Scientific research & development (Division 72) and Legal & accounting activities (Division 69) which between them contributed £4.5 billion to aGVA. Turnover in Transport & storage increased by 5.4% (£7.7 billion) between 2011 and 2012, with purchases rising by 5.9% (£4.9 billion) resulting in a 5.5% (£3.4 billion) increase in aGVA. The main industries driving growth within Transport & storage were Warehousing & support activities for transportation (Division 52), and Postal & courier activities (Division 53). Increases in this sector may be related to the effect of the Internet economy. Data on the retail sector indicates that turnover from mail order and via the Internet continued to increase at a higher rate than turnover from shops. Increases seen in Warehousing & support activities for transportation and Postal & courier activities are likely to partly result from the delivery and storage of items ordered from the Internet. Real estate experienced an 11.9% (£5.5 billion) rise in turnover, which, coupled with a smaller 8.8% (£1.6 billion) increase in purchases, resulted in growth in aGVA of 11.6% (£3.4 billion) between 2011 and 2012. The main driver of this aGVA growth came from Renting & operating of own or leased real estate (Class 68.20), which accounts for the majority of the increase in Real estate activities. Businesses in this industry have noted that a growing rental market has resulted from a trend of falling owner occupation, probably caused by increased mortgage constraints. The ABS has included estimates for the Insurance & reinsurance industries (SIC 2007 Groups 65.1 and 65.2 respectively) in its UK National releases since 2008. This is the only part of Financial and insurance activities (Section K) covered by the survey. As with any new time-series, estimates for these industries have remained experimental while ongoing quality assurance has taken place. This quality assurance has led the figures to be revised substantially in recent years with a resulting break in the series between 2009 and 2010. Due to ongoing volatility the estimates for this series have been removed since November 2013 to allow for a more detailed quality assessment to be undertaken. The removal of these series does not affect other industries published as part of this release and has no impact on any other financial statistics published by the ONS. The Production sector in 2012 provided just under a quarter (22.8%) of the estimated aGVA total of £936.3 billion for the UK Non-Financial Business Economy. Between 2011 and 2012, unlike in the Non-Financial Service sector, both Production sector turnover and purchases decreased (by 0.4% (£2.9 billion) and 1.1% (£5.4 billion) respectively). This led to a decrease in aGVA of 0.8% (£1.6 billion). This fall in aGVA follows two consecutive annual increases and sees aGVA drop further below the level seen in 2008 at the start of the recession (see Figure 7). When compared to the ABS Provisional results published on 14 November 2013, the final 2011 results show a downward revision to aGVA of -£6.9 billion, while the revised 2012 results show an upward revision of £1.3 billion. These revisions were driven by Manufacturing (Section C) and Energy generation & supply (Section D) as a result of a small number of businesses providing additional data, further validation of existing data or reporting restructuring. 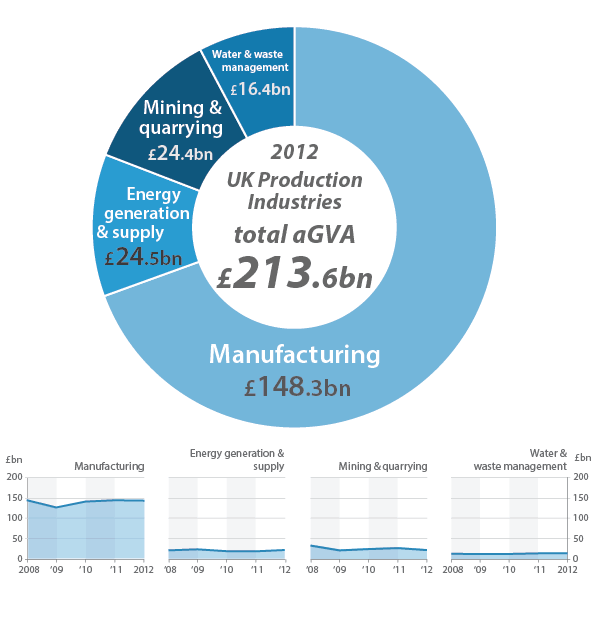 In the Production sector between 2011 and 2012, Section B (Mining & quarrying) and Section C (Manufacturing) saw falls in aGVA of 14.8% (£4.2 billion) and 0.7% (£1.0 billion) respectively. Over the same period Section D (Energy generation & supply) and Section E (Water & waste management) saw increases in aGVA of 15.4% (£3.3 billion) and 1.9% (£0.3 billion) respectively (see Figures 8 and 10). Turnover in Mining & quarrying decreased by 7.5% (£4.0 billion) while purchases increased by 1.7% (£0.4 billion) resulting in a 14.8% (£4.2 billion) decrease in aGVA. This decrease was almost entirely driven by Extraction of crude petroleum and natural gas (Division 06) which saw a 20.0% (£4.9 billion) decrease in aGVA which may be a result of prolonged periods of maintenance to offshore oil rigs. For Manufacturing there were decreases of 0.6% (£3.4 billion) in turnover and 1.8% (£6.4 billion) in purchases between 2011 and 2012. This resulted in a decrease in aGVA of 0.7% (£1.0 billion). The decrease in manufacturing aGVA was driven primarily by Manufacture of basic metals (Division 24), Manufacture of computer, electronic & optical products (Division 26), Manufacture of motor vehicles, trailers & semi-trailers (Division 29), Manufacture of chemicals & chemical products (Division 20) and Manufacture of basic pharmaceutical products & pharmaceutical preparations (Division 21). Together these five divisions account for a decrease in aGVA of £3.1 billion (see Figure 9). The £1.0 billion decrease in aGVA for Manufacture of basic metals (Division 24) was impacted by the closure in recent years of the UK’s two largest aluminium smelters. The £0.5 billion decrease in aGVA for Manufacture of basic pharmaceutical products and pharmaceutical preparations (Division 21) was cited by some businesses as a result of decreased exclusivity of some previously patented products. Of the divisions showing growth between 2011 and 2012 the largest growth was in Manufacture of fabricated metal products, except machinery & equipment (Division 25) which showed a rise in aGVA of 9.6% (£1.3 billion) and in Repair and installation of machinery equipment (Division 33) which showed a rise of 17.2% (£1.0 billion). The picture within Manufacturing was mixed with around half of the 24 divisions experiencing decreases in aGVA between 2011 and 2012. Across the Production sector many divisions have been affected by a trend amongst multinational companies towards restructuring on an international basis. Such restructuring has caused companies to be classified under different sectors to those they have historically occupied, with movements from traditional production industries towards wholesalers and toll processors. Electricity generation & supply saw turnover increase at a higher rate than purchases between 2011 and 2012 (4.7% (£4.7 billion) and 1.4% (£1.1 billion) respectively), resulting in aGVA increasing by 15.4% (£3.3 billion). Rises in turnover and purchases are thought to be influenced by increased price of raw materials influenced by international events such as the closing of Japan’s nuclear program and Middle East unrest. The population rise of micro-businesses (with less than 10 people in employment) in this sector is thought to be due to the growth of small producers of renewable energy encouraged by various green grants, subsidies and "feed in tariffs". The Distribution industries in 2012 provided 15.4% of the estimated aGVA total of £936.3 billion for the UK Non-Financial Business Economy. This sector saw a 2.6% (£34.6 billion) rise in turnover and a larger 3.1% (£35.8 billion) increase in purchases between 2011 and 2012. This contributed to the decrease in aGVA of 4.7% (£7.1 billion). This second consecutive annual decrease keeps aGVA for the Distribution sector below the level seen in 2008. at the start of the recession (see Figure 11). When compared to the ABS Provisional results published on 14 November 2013, the final 2011 and revised 2012 results show downward revisions to aGVA of -£10.9 billion and -£6.8 billion respectively. These revisions were driven by downward revisions to Wholesale (excluding Motor trades) (Division 46) and resulted from a small number of businesses providing additional data, further validation of existing data or reporting restructuring. Performance within Distribution was mixed (see Figures 12 and 13), with the decrease in aGVA between 2011 and 2012 driven by Wholesale (excluding Motor trades) (Division 46). Wholesale experienced an increase in turnover of 2.7% (£23.0 billion) and purchases of 3.4% (£26.7 billion) between 2011 and 2012. However, aGVA saw a large decrease of 15.1% (£8.6 billion), although the change without industry restructures and reclassification changes would be less pronounced. The fall between 2011 and 2012 was driven by changes to Other specialised wholesale (Group 46.7). Performance for this industry group is volatile as it is heavily influenced by changes in oil prices. The high oil prices seen in 2011 have continued into 2012 and wholesalers may have been reluctant to pass the higher prices onto their customers. 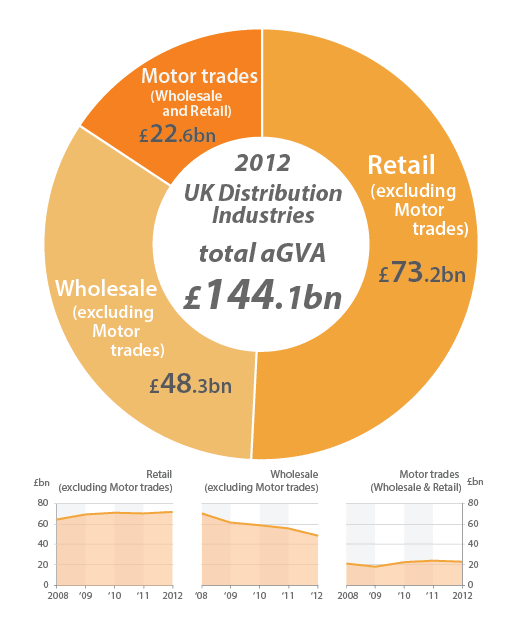 Motor trades also contributed to the fall in aGVA in Distribution between 2011 and 2012, with a decrease of 3.7% (£0.9 billion), as purchases increased at a higher rate than turnover, 4.6% (£5.3 billion) and 3.8% (£5.2 billion) respectively. This fall follows two consecutive annual increases. Within Motor trades, Maintenance & repair of motor vehicles (Group 45.2) contributed to the fall in aGVA between 2011 and 2012, decreasing by 5.5% (£0.4 billion). This is perhaps a result of consumers putting off car repairs in response to the uncertain economic climate and falling real incomes. The last few years have seen noticeable changes in the drivers within this division, between sales of new vehicles and maintenance of old vehicles. For example, the Sale of motor vehicles (Group 45.1) saw strong growth between 2009 and 2010, followed by a small fall in aGVA between 2010 and 2011 suggesting that consumers could have brought forward purchases of new cars to take advantage of the Government car scrappage scheme (which ran from May 2009 to April 2010). The group experienced a slight fall of 0.4% (£0.05 billion) in aGVA between 2011 and 2012. On the other hand, Maintenance & repair of motor vehicles (Group 45.2) saw very little growth between 2009 and 2010, followed by much stronger growth between 2010 and 2011 when the scrappage scheme had ended. Between 2011 and 2012 aGVA in this group has also fallen. In contrast, aGVA in Retail saw an increase of 3.3% (£2.3 billion) between 2011 and 2012. This growth in aGVA was a result of a 1.9% (£6.4 billion) increase in turnover and a smaller 1.4% (£3.8 billion) increase in purchases. The increases in aGVA were driven by a 5.6% (£1.2 billion) rise in Retail sale of other goods in specialised stores (Group 47.7) which includes retail sale of clothing and footwear, and a rise of 26.9% (£0.9 billion) in Retail sales not in stores, stalls or markets (Group 47.9) which includes Internet sales. This was countered by a decrease of 36.1% (£0.7 billion) in Retail sale of automotive fuel in specialised stores (Group 47.3) which includes petrol stations. Perhaps unsurprisingly, reports from businesses indicate that turnover from mail orders and via the Internet increased at a higher rate than turnover from shops. Although increasing, retail sales from mail order and the Internet remain a small share of total turnover. The rise may be due to customer demand for better value for money, and businesses diversifying to cut expenditure. Construction turnover decreased slightly by 0.2% (£0.3 billion) between 2011 and 2012 with purchases decreasing by a larger 2.3% (£2.8 billion) to give overall growth in aGVA of 2.9% (£2.1 billion). This is the second consecutive year of growth, but still leaves Construction aGVA £12.6 billion lower than the level in 2008 at the start of the recession (see Figure 14). When compared to the ABS provisional results published on 14 November 2013, the final 2011 results show an downward revision to aGVA of £0.5 billion, while the revised 2012 results show a downward revision of £0.4 billion. These revisions were a result of a small number of businesses providing additional data, further validation of existing data or reporting restructuring. The growth in Construction was driven by Construction of buildings (Division 41) which saw a 10.4% increase in aGVA between 2011 and 2012, while Civil engineering (Division 42) saw only a minor 0.8% increase. Specialised construction activities (Division 43) experienced a fall in aGVA of 1.4%. Construction of buildings which drove the growth in the Construction sector, experienced an increase in aGVA of 10.4% (£2.4 billion) between 2011 and 2012 as a result of a 3.8% (£2.7 billion) increase in turnover and a 0.2% (£0.1 billion) fall in purchases. The main driver of the change was an increase in Development of building projects (Group 41.1), which saw a rise in aGVA of 25.0% (£1.8 billion). The ABS covers only hunting, forestry, fishing and the support activities to agriculture. Commentary is therefore limited because its size in terms of economic output, as measured by the ABS, is small in comparison to the other sections of the UK Non-Financial Business Economy. However, data for these parts of Section A can be found in the reference tables linked to this bulletin. The other parts of agriculture, which include crop and animal production, are covered by the Department for Environment, Food and Rural Affairs (DEFRA). The part of Section A covered by ABS showed rises in turnover of 0.9% (less than £0.1 billion) between 2011 and 2012 and purchases of 11.3% (£0.2 billion) which led to a decrease of 11.4% (£0.2 billion) in aGVA between 2011 and 2012. This fall means that, at £1.4 billion, aGVA still remains lower than the level in 2008, at the start of the recession. Validation of data returns for 2011 highlighted a small number of businesses within agriculture (Division 01) which needed to be reclassified resulting in revisions to the 2010 and 2011 figures. In line with the ABS revisions policy previous years (2008 and 2009) have not been revised and users should therefore take caution when comparing figures overtime. Map 1 shows the share of the total value of EU-28 aGVA in the business economy of each member state in 2011 (the latest figures available). The UK contributes between 10% and 20% of total EU aGVA. 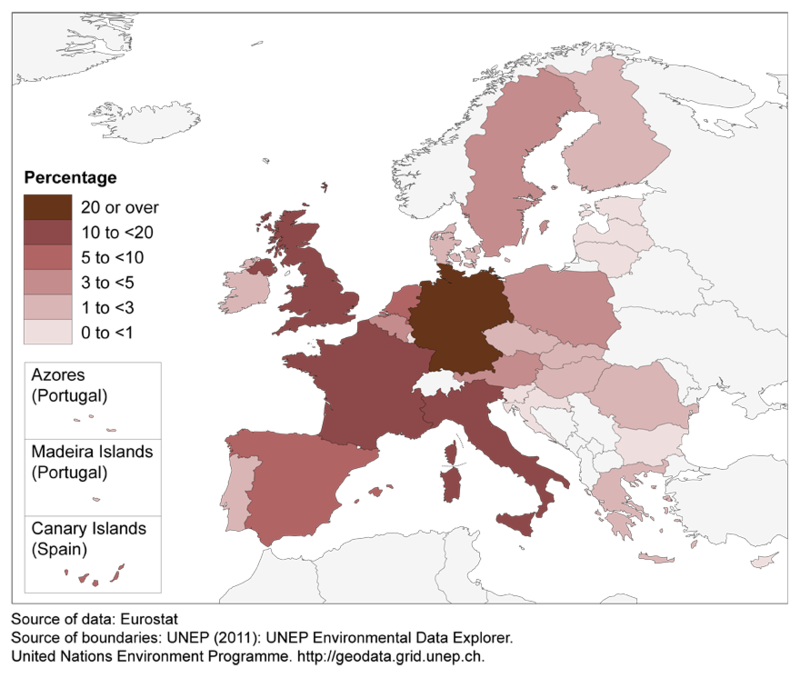 Germany accounts for over 20% of EU aGVA. France and Italy are the only other member states that contribute more than 10% of EU business economy aGVA. The ABS survey samples approximately 62,000 businesses in Great Britain from a population of over 1.8 million businesses in the sample frame on the Inter-Departmental Business Register (IDBR). The responding businesses provide information such as their turnover, purchases, employment costs, capital expenditure and stocks. Data for approximately 11,000 businesses in Northern Ireland are collected by the Department of Finance and Personnel Northern Ireland and contribute to the UK estimates. In this National Statistics publication, a range of estimates are published including turnover, purchases, approximate Gross Value Added at basic prices (aGVA) and employment costs for industry sectors and the UK Business Economy. All data are reported at current prices (effect of price changes included). An ABS Glossary (405.2 Kb Pdf) of terms is available to help interpret the technical descriptions and abbreviations used throughout this bulletin. A Quality and Methodology Information (QMI) report (149.3 Kb Pdf) for the ABS can be found on the ONS website. The aims of the QMI report are to provide users with a greater understanding of ONS’s statistics, their uses and the methods that are used to produce them. The ABS is a sample survey. As with all sample surveys, estimates are subject to various sources of error. The total error in a survey estimate is the difference between the estimate derived from the data collected and the true (unknown) value for the population. The total error consists of two main elements; the sampling error and the non-sampling error. The ABS was designed to minimise both these errors. The standard error is the estimated value of the sampling error. The estimate for a variable, plus and minus the standard error for the variable, gives a range in which the true unknown value for the population should lie. The closer the standard error is to 0, the more reliable the estimate. The coefficient of variation is the standard error of a variable divided by the survey estimate, and it is used to compare the relative precision across surveys or variables. The closer the coefficient of variation is to 0, the more reliable the estimate. Coefficients of variation enable the comparison of the relative precision across surveys or variables. Standard errors and coefficients of variation for turnover, aGVA, purchases, employment costs and capital expenditure are available in the quality measures table published with this release. More detailed information on these and other quality and methodology issues is available in the ABS Technical Report (1.61 Mb Pdf) published on the ABS webpages. When ABS responses are received, checks are undertaken to ensure the information is correct. This is known as editing and validation. Selective editing has been used to validate responses for the first time for the 2011 results using software called SELEKT. SELEKT is a generic selective editing tool which highlights responses which appear to be in error if they fall outside the range of what is expected and have a large influence on key estimates. Those responses with the highest score are prioritised for editing and validation. This increases the efficiency of the editing process by focusing on the responses with the highest impact and importance. has there been a shift in activity from one industrial sector to another, and which industry groups/classes/subclasses are driving the change? National Accounts: The statistics produced help to improve the overall quality of the UK National Accounts and the measurement of Gross Domestic Product (GDP). The ABS forms a major data input to the production of Input-Output Annual Supply and Use Tables used to set the annual level of UK GDP. The Supply and Use tables show the sales and purchases relationships between consumers and producers by industry (see section 2.1 of UK National Accounts). Business consultants: Use these data to understand trends in industry sectors and UK regions. Marketing experts: Use these data to undertake demographic mapping and market segmentation. Other local and national government departments and bodies, businesses, academics and the general public use these data for research, modelling or forecasting and to track industry trends. We are constantly aiming to improve this release and its associated commentary. We would welcome any feedback you might have, and would be particularly interested in knowing how you make use of these data to inform your work. Please contact us via email: abs@ons.gsi.gov.uk or telephone Heather Bovill on +44 (0)1633 455107. The Changing Shape of Trade and Investment in the UK, an event coordinated jointly with the Department for Business, Innovation and Skills (BIS), took place in September 2013. The event featured a range of talks from users, producers and suppliers of business trade and investment statistics, not just from central government and the devolved administrations, but also local government, media, business representatives and researchers. To view the content of the day, please visit Storify. Eurostat: analysis of the European business economy. ABS estimates are revised in line with the ABS Revisions Policy. The revisions policy is available in the ABS Technical Report (1.61 Mb Pdf) to assist users with their understanding of the cycle and frequency of data revisions. Users of this release are strongly advised to read this policy before using the data for research or policy related purposes. As an example of the timing and scale of revisions, provisional national data for 2012 were first published in November 2013 and were then revised in this June 2014 release. Between the provisional and revised 2012 national releases there was an overall change in the estimate of UK Non-Financial Business Economy turnover of -0.8% (-£27.7 billion). At the same time (June 2014) national data for 2011 were also revised. Revisions to data provide one indication of the reliability of key indicators. A table (97 Kb Excel sheet) showing the size of revisions is published alongside the statistical bulletin released in June each year. The figures in this release are based on an annual survey of businesses. Revised 2012 results are based on a response rate of 77.8%. Response rates by different sectors can be found in the Quality Measures spreadsheet accompanying this release. For an estimate of the cost to GB businesses for providing their data to the ABS (known as compliance cost) see appendix G of the ONS Compliance Costs Report. The results in this Statistical Bulletin represent approximately two thirds of the UK economy in terms of Gross Value Added. In previous releases the UK Non-Financial Business Economy has been referred to as the Whole Economy. Data for a small part of the Financial and insurance sector (Insurance and reinsurance only (SIC 65.1 and 65.2)) has been collected by the ABS since 2008 and was previously included in the results. However, following discussions with key users, ONS decided to remove this experimental series from ABS releases for the reference year 2012 onwards due to the continued volatility of the data. A review of the questionnaire for Insurance and Reinsurance businesses will be undertaken, alongside continued validation of returns to the survey, with the aim of reintroducing them to the ABS publications when the quality of the data has improved. Updates on progress will be available on the ABS News Page. UK SIC 2007 is divided into 21 sections, each denoted by a single letter from A to U. Each section can be uniquely defined by the next breakdown, the divisions (denoted by two digits). The business economy is constantly evolving as businesses merge, are taken over, or simply change the main focus of their business. These changes can result in the industry classification of a business changing over time. For example, if a business undertakes both manufacturing and wholesale activities, but most of its employment is within manufacturing, it will be classified to manufacturing. If the employment were to change substantially so that the majority worked in wholesale then the industry classification would change and the whole of the businesses turnover, for example, would move from manufacturing to wholesale. In industries where movements are common, or where large businesses are involved, these changes can themselves sometimes cause large changes in ABS estimates. This should be taken in to consideration when changes over time are being assessed. There are conceptual differences between the two measures of gross value added. For example, some production activities such as illegal smuggling of goods must be included in the National Accounts but are outside the scope of the ABS. There are three approaches to measuring GDP; one based on production activity, one based on expenditure, and one based on income. In theory, the three approaches should produce the same estimate of GDP. However, in practice this is never the case because the three approaches make use of different data sources, each with their own definitions and limitations. The three different estimates are therefore reconciled in a process known as Supply and Use balancing. The balancing process is informed by a variety of data sources, and results in adjustments to estimates of output and intermediate consumption. For many industries, the balancing adjustment is the greatest source of difference between estimates from the ABS and the National Accounts. More detailed information of the differences between aGVA and GVA is available in the ABS Technical Report (1.61 Mb Pdf) published on the ABS webpages. There is also a recently published article ‘A Comparison between ABS and National Accounts Measures of Value Added’ (462.3 Kb Pdf) which provides more detail. The reference tables that support this release include estimates of employment. The ABS does not collect employment level information so instead this key information is taken from another source. In the past, employment data were collected via the Annual Business Inquiry / Part 1 (ABI/1), however, in 2009, ABI/1 was replaced with the Business Register and Employment Survey (BRES). The ABS and BRES are both optimal for their respective purposes, however caution should be taken when combining the financial data from the ABS and employment information from BRES to calculate estimates due to differences in methodology. More information on the differences between ABS and BRES is available in the ABS Technical Report (1.61 Mb Pdf) published on the ABS webpages. It is sometimes necessary to suppress figures for certain items in order to avoid disclosing information about an individual business. Further information on why data are suppressed is available in the ONS Disclosure Control Policy or in the ABS Technical Report (1.61 Mb Pdf). There is a Business and Trade Statistics community on the StatsUserNet website. StatsUserNet is the Royal Statistical Society’s interactive site for users of official statistics. The community objectives are to promote dialogue and share information between users and producers of official business and trade statistics about the structure, content and performance of businesses within the UK. Anyone can join the discussions by registering via either of the links above. Statistics are available on the ONS web pages categorised by themes, subject areas, topics and sub-topics. If you are interested in statistics on a particular issue, navigating through the categories will identify all the statistics available that relate to the selected theme, topic or sub-topic. ONS has published commentary, analysis and policy on 'Special Events' which may affect statistical outputs. For full details visit the Special Events page on the ONS website. ABS UK national results at the industry class level (4 digit Standard Industrial Classification 2007) are available free of charge via the 'Data in this release' button at the top of this publication, or from the ABS webpages on the ONS website. The published variables include turnover, purchases, aGVA and employment costs. Any bespoke analysis carried out for ABS customers will be listed on the ONS data available on request web pages, and the data sets will be available free of charge on request.